The below is a modified re-post of a blog I had on a my MySpace page in late 2009. This is now connected to my website where you can hear the full composition. In 2007 I was commissioned by the Albany Symphony to write a musical composition commemorating the 400-year anniversary of Henry Hudson’s discovery of the Hudson River. A few rules were: it had to be a vocal work and it had to be short – no longer than 8 minutes. Otherwise, I didn’t have to write about anything specific. This was all occuring as my father was beginning the final, awful stages of Parkinson’s in a nursing home. He had by now lost the ability to eat through his mouth, to walk, and speak very much. I almost did not want to write any music. I finally made a personal compromise and decided that I could somehow write something to express my love for him and still write about Henry Hudson. My father loved sailing, and I grew up going sailing with him since an early age on the Pamlico River in Eastern N.C. There is connection one – he and Hudson were sailors. Henry Hudson’s demise came as a result of a mutiny in 1611, when mutineers cast him adr ift with his son (connection 2) and several others because he wanted to press on through the Hudson Bay in Canada and they did not. The setting adrift of Hudson became a metaphor for me of my father being cast adrift mentally from the life he loved. I play the role of the dutiful son who can’t but follow him in this dark odyssey. I tried to write the text of this musical piece – 8 minutes is not a long time. I did due diligence and searched for what poetry was already out there on the subject and found only one. This one. (“The Shallop on Hudson Bay” – part of “The White Bees” by Henry Van Dyke) At five pages, it was a half hour minimum as a musical setting. I also thought about the musical repertoire, and thought immediately about Schubert’s “The Erl-King” (opus 1), the ubiquitous song taught in every music theory class at some time or another. (Connection #3, my father was a theory teacher and taught this work like thousands of other teachers.) 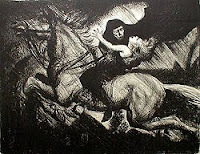 The text is by Goethe, and is about death. 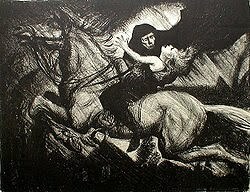 The death of a child in the arms of his father during a wild horse ride with Death marking them every step of the way. I had the idea of turning this upside down. The son carrying a dying father. A fictional scenario: Hudson waning in dementia in his skiff, as piloted by his young son, who until now has been too young to ever take the helm. This was like a real experience I had in October of 2005 – the last time I ever went sailing with my father. Throughout all the years of sailing with him, I had never actually sailed his boat completely alone. I had asked to on many occasions, and he always said he would take me on an official learning cruise. So, we had our last sail and this time, he actually let me (and a friend I brought) do it for awhile. Being October we were the only ones on the river. A thunderstorm hit and we were challenged more than normal. My father, knowing I wanted to go it alone, just watched from beneath the brim of his hat. I realized I didn’t really know what the hell I was doing after all – I was reading the compass upside down and was, for a few minutes, lost on a river I had spent 30 years on. It was fabulous. It was the round-the-world adventure of myth encapsulated in a moment. I wrote more poetically about this in 2007 as part of my Glass Dwellers book, you can fish out three autobiographical experiences in the upside-down Molly Bloom-like soliloquy (each paragraph begins with a “No” instead of a “Yes”; every paragraph is a single run-on sentence; it takes place entirely in one person’s head: the evil dictator of the book, who is about to be pegged in his bunker at the very moment of his supposed victory). So, how to juggle, in 8 minutes, the upside down “Erl-King,” the poem by Henry Van Dyke, my own personal experience of my final sail with my father, and my current feelings for him as he lay trapped in his head, staring at the stuccoed ceiling of a nursing home, where he continued to lie for another entire year after I wrote “Passage.” I did get to play this recording for him on headphones during his later period when he could not respond verbally. My thanks to the Dogs of Desire for performing this work. A local review excerpt may be read here.